Raising Ella Lynn: 4 weeks already? Ms. Ella Lynn is 4 weeks old today. These 4 weeks have flown by and have been so life altering and so predicable all at the same time. We are just like every other family with a new baby. No sleep, worrying over how much she eats and poops, begging for just 10 more minutes of sleep before the next feeding, hoping our 2 other kids are getting enough attention, taking the older two to sports, birthdays, homework, you know, just normal life. On the other hand, nothing is normal in our lives right now. We are going to doctor after doctor checking on her heart (all good), her eyes (still waiting), her feedings (getting better). We are learning all about early intervention programs and how to apply for the disability programs she will need through the state. 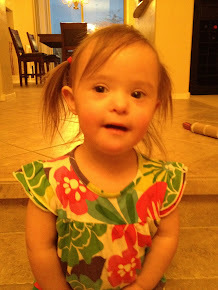 We are meeting moms and dads of other kids with Down syndrome and learning about their experiences. We are making sure Ella is going to be afforded every ounce of therapy and extra help she will need. I am embracing my new role of being Ella's advocate but sometimes still feel like I am in this dream world and I will wake up from it still pregnant with a baby in my belly that doesn't have any extra chromosomes. I know that isn't going to happen and I have accepted our new life, but there are times I catch myself thinking "is this really happening to us". I wouldn't trade Ella for anything but just 2 months ago my thoughts about having a newborn were more along the lines of how fast I could get back into my bathing suit, not about how fast we can get physical therapy lined up and what exactly having extra chromosomes mean. Everyone we meet keeps asking us if we are allright. They look me in the eyes and say things like "are you sure you are OK" and "do you need to talk?" I feel weird because I am OK. I am still me, I still get mad at my kids and frustrated when Ella won't eat. I feel like I should feel different or be crying all the time or not want to hold her or something. The only things I feel are happiness at our new family and anxiousness (is that a word) for the future. I worry about a lot of things that are out of my control right now but I worry anyways. Will Ella have friends in school? Will people look at her funny when are out? Will she drive, go to prom, have a boyfriend? I stay up at night worrying about these things and I know I have to stop and only worry about tomorrow, but I can't. I guess if that is the worst thing that I feel then I am OK. I worry about the same things for my other kids too and that helps me get through the night. Just because they are "normal" doesn't mean life won't be hard for them too at some point. Life is hard for all of us and how we embrace the challenges makes us what we are as adults and I hope Ella learns that even with the challenges she faces, she will have a family that is always there for her and love her no matter what. Ella has her 4 week doctor appointment this afternoon, I am anxious to see how much weight she has gained. The weight issue has been our only problem so far. She is little and the dr had wanted to see more weight gain by now. We have been doing everything we can to get her to eat more, but she is very strong willed already and when she is done, she is done. No amount of bribing (I tried to bribe her with her very own Prada purse as soon as she could walk, no luck) works. We think she is just a slow starter and want to give her time to figure out this new world and eating and all that. The dr's like to immedialty jump to scary things like feeding tubes but we think that option is a long ways off. Hopefully I will have good news to report about her weight gain after the dr. apt this afternoon! Other than being a little shrimp, she is doing great. She loves watching her brothers argue and she seems to love to be out and doing stuff with us. She justs fits into our lives so perfectly and while I miss my sleep, I wake up to feed her so excited to just stare at her for a little while. Ryan and Reed are the best big brothers. I worry that their excitement might result in smothering her little head sometimes, but with a gentle reminder they back away and admire baby from a far. I will leave you all with a picture her Grandma Bridget took this weekend of her. I think she is precious and perfect, don't you!